Do you sometimes feel overwhelmed by everything you want to accomplish as a teacher? Do you ever wish you were better organized for the school day? 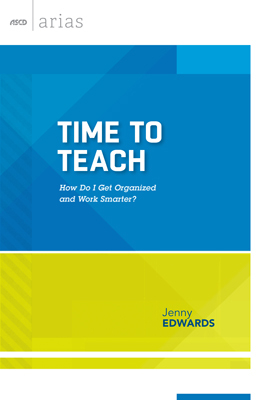 Experienced educator Jenny Edwards offers positive and practical ideas for more effectively using your time to accomplish your goals. Start by analyzing how you use time now and identifying areas you’d like to improve. Then apply more than a dozen time-management strategies, such as breaking a task down into doable pieces, touching paper or e-mail only once, and learning when to say no. With time-saving tips for planning lessons, assessing students, keeping records, communicating with parents, delegating tasks, and more, this timely publication will show you how to make the most of the hours you have—so you can spend them on what matters most. JENNY EDWARDS, PhD, has taught at the elementary, middle school, and university levels. In addition, she served in staff development in Jefferson County Schools in Denver, Colo., for four years and was involved in mentoring first- and second-year teachers and presenting seminars. She earned a Bachelor of Science degree in elementary education from the University of Tennessee at Knoxville (UTK), specializing in early childhood education; a Master of Science degree in elementary education from UTK, specializing in reading; and a doctorate in human and organizational systems from Fielding Graduate University in Santa Barbara, Calif.